Maybe this should be under “Commuting”, but since “Eye Candy” *does* include “significant obstacles or road hazards along the way”, here is one. Well, three. 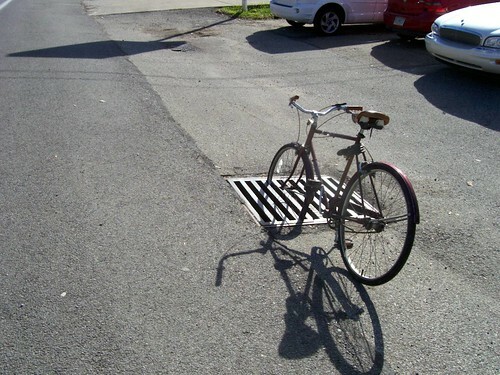 I encountered the worst case I have yet seen of a drain grate that can eat bicycles. It’s on Babcock Boulevard in Ross Twp, near Northway Mall. It’s on the uphill/northbound/eastbound side, just before the traffic light and peel-off for the mall. What makes it particularly bad is that it is DIRECTLY IN THE PATH of where cyclists ride. Huge slots, capable of eating any road tire, would cause an immediate catastrophic accident. 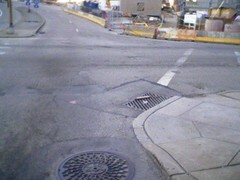 On a different part of Babcock, between Three Degree and Siebert, in front of #3365, is another longitudinal grate. While it’s a teeny bit out of the way, it’s also DOWN about six inches. The hole alone is certain to cause an overthrow, even if you straddle two slots. Yet another at #3333 Babcock, a bit farther still off the road, and almost level with the road surface, but still a potential hazard. I will post these on the SPC site, but in the meantime wanted to be sure to document them here. What others are out there? I just remembered another myself. In the hamlet of Ingomar, when turning right from westbound West Ingomar Road onto northbound Harmony Road, there is a wheel-eating drain grate smack in the middle of the turn. Let’s use this thread to document all the others out there! Getting these replaced would be fairly low-cost, high-priority work, I’d think. There’s something really wrong with this board. Twice, just now, I posted a reply containing an IMG tag. First the tag got eaten, though the text itself remained. Then, upon editing to replace the IMG tag with just a URL to the photo, the whole reply disappeared. Attempting to post a reply containing just the URL to the photo has the same effect as not trying in the first place. It just goes away. Editing a text-only post seems to work fine. I’d bet they could just turn that 90 degrees. I think you’re right. I went up there yesterday and did a rough measurement with a pen, and yes, it’s almost exactly square. In fact, I’d reckon anyone with a crowbar could turn it 90 degrees. The only downside is that you’d look like a metal thief, but arriving on a bicycle is probably a defense from that. Actually the thought that crossed my mind was to bring my station wagon, a bicycle, a crowbar, and a couple of highway cones. Block traffic with the car, set out the cones to direct traffic to the passing lane, park the bicycle in front of the car, and flip the grate. If a cop wonders what in tarnation I’m up to, I simply demonstrate with the bike that I was avoiding a catastrophe. Probably wouldn’t take me 15 minutes. And if PennDOT or whomever wanted to throw me a C-note for my trouble, that’s fine with me. It’d probably cost them/taxpayers a grand to send a crew out to do it. In May. Anyway, Sara said she reported it to the proper authorities, so I’m seeing how long it’s going to take them. If it’s still not done next May, I’ll do it myself and send them a bill. I ride up that road 4x a week, and always have to dodge that crate, with pissed off cars on my arse. I safely signal, and always have to time it so that I don’t swerve in front of a car. I would love to have that grate turned, lets do whatever it takes to do it before someone gets hurt. Going up that hill where the GetGo is probably the only stretch of babcock that I don’t feel safe on coming from Millvale, but for the most part it’s OK.
Did you get any follow-up from SPC on this? You might want to email Sara W. just in case. So far, no, other than talking with her when she gave me the bike frame a couple of weeks ago. I don’t think it’s been fixed yet. 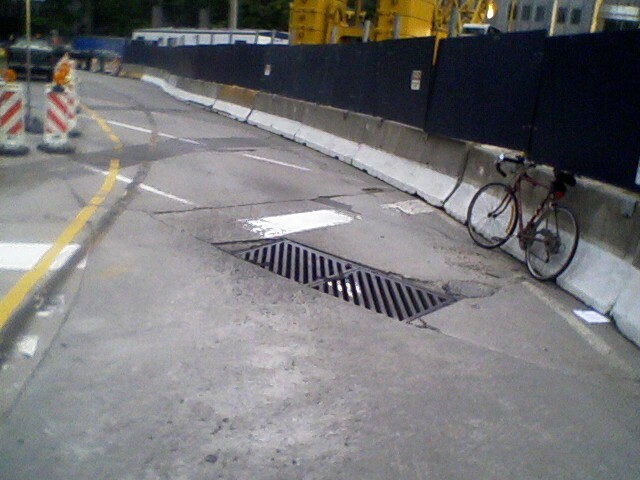 There’s also a huge hole/grate going north on babcock towards 3 degree. It is right after the shell station near Thomson Run. I came close to hitting it on my way up the first time. i heard back from penndot today and they said that the county is supposedly on it. hope these get changed out really soon. thanks for taking action on this stu. see how easy it is folks!? we need more people using that form on SPC’s website and 311! 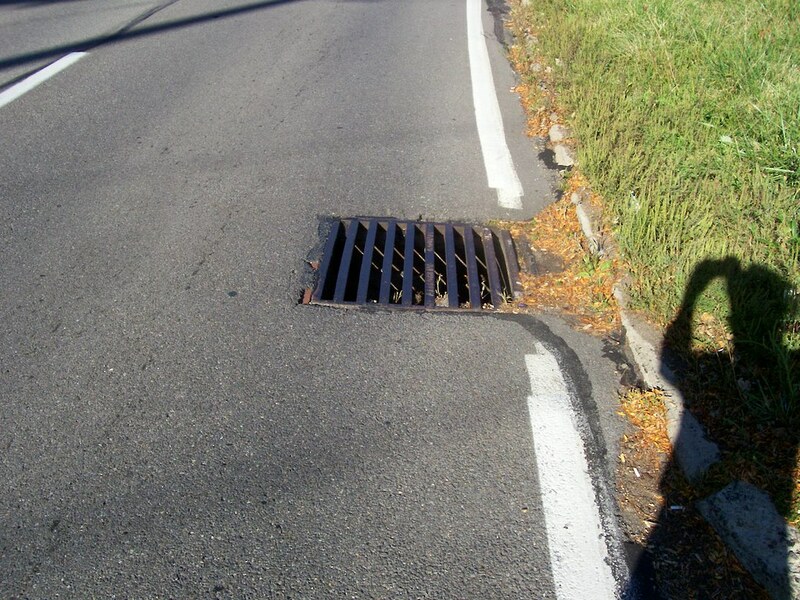 I just received a copy of the email requesting that Allegheny County Maintenance turn the grate on Babcock, between Browns Lane and Roderick Drive 90 degrees, or replace it with a bicycle friendly grate. This is the first location identified by Stu in his original post. We should see action on this item relatively soon. I’ll continue to pursue the others. 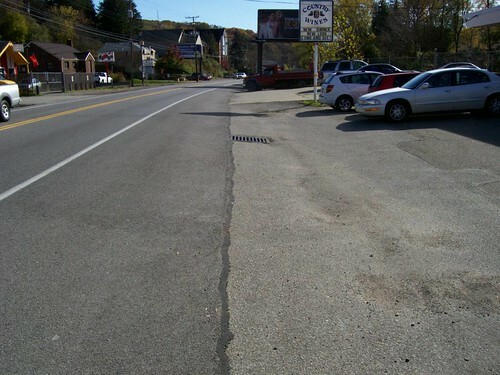 I’m on Babcock between Northway Car Wash (Babcock & Babcock & 3 Degree) and Millvale constantly. There are no serious problems on that stretch other than the couple I’ve mentioned. FlyS564, do you mean Siebert? Yeah, between Siebert and 3D, going north, there are a couple of potentially troublesome grates, but you’d have to be well off the road to hit them. I don’t do the piece between McKnight/Peebles and 3D all that often. I will check on the original bad boy later today when I run out. North of McKnight/Babcock/Perrymont, towards North Park, I don’t remember seeing anything real serious. I’ve been on Babcock all the way up to Mars-Valencia Road (Willie’s Tavern), both directions, and don’t recall any bad storm grates. As of 1:20 p.m. today, F11/07/2008, it’s still unfixed. And no, there are no other bad ones between 3D and McKnight. Well, there is one of the same wide-open type, right by Roderick (by N’way Mall entrance), but it’s properly sideways. @flys564: Confirmed, there is a huge hole on northbound Babcock, about 0.1 mile beyond Thompson Run Rd, between Kretzler’s and Cottman Transmission. It’s similar to the hole at 3365 Babcock, but without the grate. 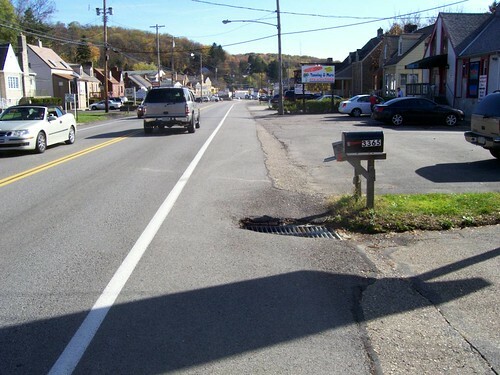 Thank you, swalfoort, PennDOT, County road dept, Bike-Pgh and everyone else involved, for getting that grate fixed. Before May. (It was actually done back in snow season.) Looks like they just turned it 90 degrees, but hey, it’s bike safe. Now for the next one: 40th Street Bridge, northbound, about 3/4 of the way across. It’s not as big as the one on Babcock, but it would sure bend a wheel if you hit it straight on. 40th street bridge is State Route 2124. PennDOT now owns it and all the problems with it. Allegheny County in their wisdom, gave it to PennDOT years ago. 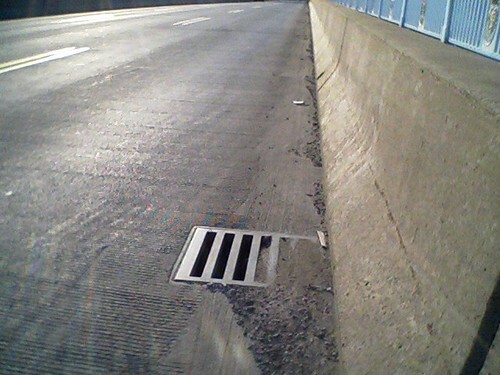 If you want to keep them on their toes, check the dimensions of the inlet grate. Neenah Foundry makes alot of replacement grates for older structures, and this one could be replaced by a “Gutter Inlet Grate” supplied by Neenah – either an R-3397 or R-3402 type. This is just a sidenote, but I was visiting Columbus (OH) this weekend and noticed that, at least in some places, there is a white slanted line pointing outward into the road in front of the sewer grates. Of course, at least where I was this weekend, people also give me an entire lane when they pass me, making it possible to avoid the grate if you have too. It’s amazing. No getting buzzed on my left arm. Another pet peeve of mine is diagonal grates on a corner, in parallel with the direction of the turn. I mentioned one above, Ingomar Rd at Harmony (westbound right turn onto northbound). A second one is on Center Avenue in West View, coming from I-279/Bellevue, by the right turn into the back of West View Plaza. I’m sure there are dozens of others. Send ’em in, folks! Eventually we’ll get ’em fixed, but first we have to know where they are! I just want to add my two cents on this subject. I really appreciate all of the things that are being done to make the City bike friendly, but the road drains are a great danger to cyclilsts. I have personally experience what can happen if you happen to go down in a drain.I ended up with a hyperextended elbow, twice inside of a week. Both times I was forced over by a car, almost as if they knew what they were doing. I think that the drain gratings out to be changed. I’ve seen some that had holes in them rather than the staight or slanted slices (that’s what I call them). An I also believe that anywhere that bstreets are widw enough there ought to be bike lanes added. The best thing that could have ever happened was for bike lanes to be addedfrom Frick Park up to S. Dallas. It makes it so much easier to navigate the debris and drains. We have a long way to go. yes we do have a long way to go. anyone seen that strange grate on smallman st, near the history center? This one is on Bigelow between O’Hara/Bayard and Parkman, right up the street from Pitt. damn, why don’t these img tags work reliably? Gotta run, I’ll fix it later. Thanks, Scott. I’ll try to get the word out today to PennDOT/County/City about the others. So far, I’ll be looking at 40th Street Bridge, and Bigelow near O’Hara/Parkman. I’ll have to look at the diagonal drain issues on Ingomar and Center to try to figure out a solution on those (intersecting roads may have differing “jurisdictions” etc. which complicate the resolution process. If you can’t see it, the grate itself is acceptable, but that two-inch slot NEXT to it would really bite. Here’s another one, Uptown, near the new hockey arena. Crossing Fifth Ave from Chatham onto Washington. i have also 311’d that smallman drain near the history center several times. Found another one, and it’s in a really prominent place, right in the middle of the construction area Downtown between Stanwix Street and the Hilton Hotel. Watch it! @stu… ran into that this morning on the Pedal PGH ride. Very bad placement on the curve. Finally got a picture of this one. I’m going to have nightmares now. You know they will replace them with horizontal grates, then when the construction is over and the road goes back to normal they will be back to longitudinal again. Downtown, construction area between Stanwix and the Hilton Hotel, outbound.